2nd Lt. Jewell Bailey Brown Promoted to Lt. Col.
10/15/2014–Burlington–On Saturday October 11, 2014 the North Carolina Wing staff members gathered to honor a Civil Air Patrol member who served our country during World War II. 2nd Lt. Jewell Bailey Brown of Elkin, NC first learned to fly at the age of fourteen and first soloed when she was 16 years old. She went on to earn her private pilot’s license followed by her commercial license. She got her instrument rating and spent several years as a flight instructor. 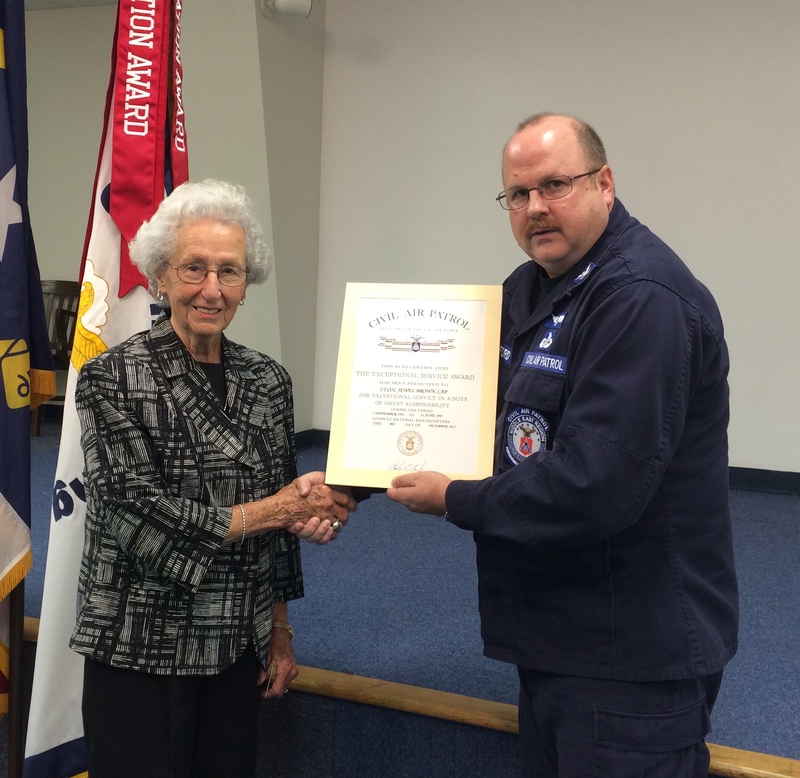 In 1943 she joined Civil Air Patrol and was an active member of the Charleston South Carolina Squadron and she participated in beach patrols during World War II. After the war ended, 2nd Lt. Brown continued her pursuit of excellence in aviation. In 1949 when she was in her 20’s she set an altitude record when she flew a Piper Super Cub to an altitude of 26000 feet. Her endurance feat was recognized in several newspapers across the country. Lt. Col. Phil Saleet, Assistant Chief Historian for Civil Air Patrol, outlined 2nd Lt Brown’s achievements and service to Civil Air Patrol and the USA. He recognized the efforts of NC Wing Chaplain, Wayne Byerly in researching CAP World War II veterans and finding 2nd Lt. Brown. Lt. Col. Saleet then invited NC Wing Commander, Col. David Crawford to present the awards.As part of the recognition, 2nd Lt Brown was promoted to Lieutenant Colonel and she was recognized for exceptional performance of duty during World War II with the CAP Exceptional Service Award.Col. Crawford also presented Lt. Col. Jewell Brown with a shadow box and three challenge coins; the NC Wing Commanders Coin, the CAP National Coin and CAP Assistant Historian Coin. After the promotion and awards ceremony concluded, Lt. Col. Saleet and his wife Pat Saleet conducted a remembrance ceremony, during which a bell was rung as the names of fallen CAP World War II veterans was read aloud.Lt. Col. Jewell Bailey Brown and her family expressed their gratitude for the recognition bestowed upon her for her service to the USA during World War II.